… that’s what the packaging says in big letters 🙂 On Friday I found my Pebble, ordered on 21st of May, 2012, finally on my table. Now, after having used it for nearly three days, I want to give a quick overview on how I’m using the watch, and what I like and dislike about it. Access some information and settings of the phone, such as its current battery level, profile (silent / normal / loud) etc. (Added 2013-10-01): Use the Pebble Locker app on my phone to have the phone locked with a PIN when the Pebble is out of reach. When the watch is connected, the phone is only locked with a simple swipe gesture. This turns out to be very useful for both phone security and convenience. It’s like as if I have my phone on a leach, and as soon as it’s further away from me than a few meters, it locks itself securely. What I can say so far: The Bluetooth connection between phone and watch is pretty reliable, and doesn’t seem to draw any noticeable amount of battery from my phone. The fact that I get all (important) notifications on my watch now let me keep the phone in my pocket for hours, when I would take it out every half an hour or so, just to find a spam SMS, or some other info that wouldn’t have been worth the effort of taking out the phone and the power consumption for a few seconds of having the display on. Therefore I already consider the concept of having a smartwatch as a kind of extended display of your phone on your arm useful. Nicely written. I ordered the same color and for the exact same reason. To program some apps on it. Let me know how it goes with the development. Thanks. I have done some hello-world stuff, but that’s about it. Wanted to get the development environment running on my Gentoo Linux desktop, but that turned out harder than I anticipated (I don’t really have experience in cross-compiling). 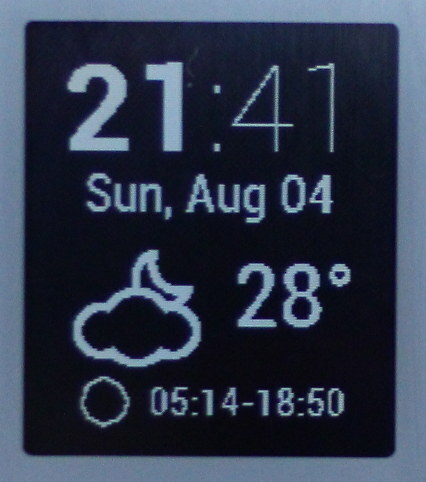 I made a couple of watch faces with the watch face generator (http://www.watchface-generator.de/) which was super-easy. Anyway, mostly using the watch with a couple of apps, my favourite still being Pebble Reminder, but recently I started using Pebble Locker, which locks the phone with a PIN when the watch is out of range. That way most of the time (when I wear the watch and carry my mobile) I do no longer have to enter a PIN or us a pattern to unlock it. Convenience++! Battery life is great, and so far the watch hasn’t given me any troubles except once it wouldn’t come out of the “ongoing call” mode after I had long hung up the call. At that point I found out that pressing back + reboot for 10 seconds reboot it, which fixed it. After nearly exactly a year of wearing the watch (nearly every day), the rubber wristband suddenly broke in two places within a couple of days. Within 3-4 days without the watch I became quite annoyed not having its functionality at my disposal, so I got a replacement wristband (black leather, 22 mm) installed yesterday. The surface is pretty badly scratched by now, and I get weird screen corruption effects quite often, which stay for a few seconds, and then vanish again. I’m also using it for sleep tracking (with the Sleep as Android app) recently. Thanks for the review, and the updates! (Always very useful to hear if people still use/like their stuff in the long term.) 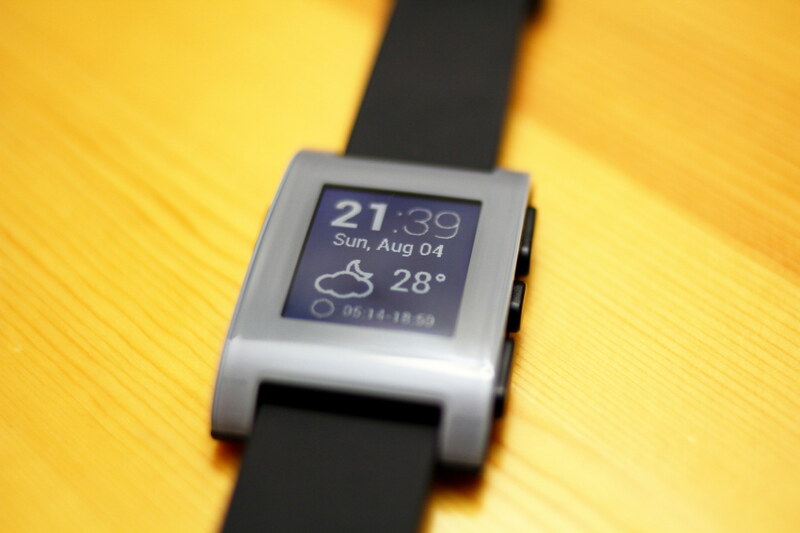 Interested to hear how you like the Pebble Time!